In 2018, The American Legion will begin celebrating 100 years of service to veterans, military personnel, families and communities. To honor the Legion’s centennial, many events at the national, department and post levels will occur starting at the 2018 National Convention in Minneapolis and continuing throughout the 2019 convention in Indianapolis. 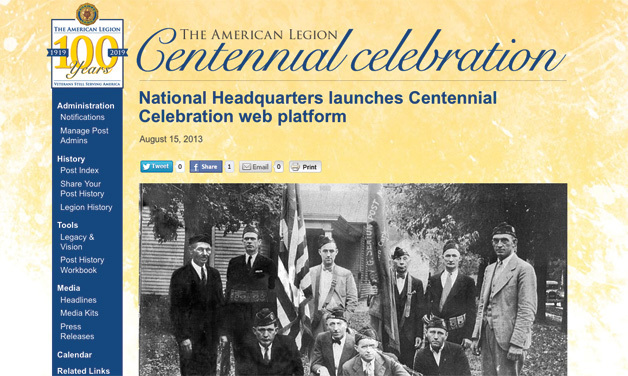 Planning for these celebratory events is currently underway by the Legion’s 100th Anniversary Observance Committee, but help is needed at the post level to tell the larger story of The American Legion’s first century. If this information isn’t accessible from post archives or members, speak with the local library or media outlets (newspapers, radio, TV) that have covered events about your post. Once your post’s centennial committee has collected photos, videos and print material related to its history, share it on the Legion’s new Centennial Celebration web page. Register (in the upper-right hand of the page) to be an administrator. The administrator of a post’s page allows him or her to monitor all content submitted to the page before it appears to the general viewing public. Click "Share Your Post History" located under "History" on the left hand navigation column. Enter your department and post number. Click "Yes, create post x." Complete the required fields needed to start; you only need your post number, city and charter date. If you don’t know when your post was chartered, put in an estimated date until you find the answer; you can add/change information as you receive it. Once your post page is created, members — and those whose lives have been touched by the post — can add historical photos, timeline events (significant moments that helped build the chronology of your history) and upcoming events celebrating your history and the Legion’s centennial. And for step-by-step instructions on how to share your post’s legacy and vision, download the Legion’s Centennial Celebration Workbook here. If your post does not have access to the technical tools or expertise needed to create a Centennial Celebration history page, the workbook features paper forms of timeline events, photo galleries and upcoming events. The forms can be submitted to a third party who is willing to create the web page and act as the post’s administrator.